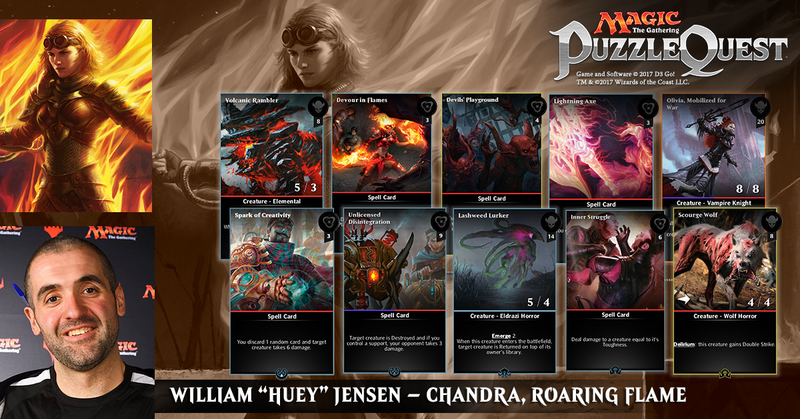 Today we introduce Team Puzzle Quest member William “Huey” Jensen. These members are sponsored Magic: The Gathering – Puzzle Quest players at Pro Tour events in 2017. Please follow them on Twitter and watch them compete at events via Twitch. Team Puzzle Quest is ranked #8 in the Pro Team Series Leaderboard. Be sure to keep an eye out for Huey in a couple of weeks at the World Championship in Boston, MA. Top Pro Tour Results: Winner at Pro Tour Boston 2003. Top 8 Pro Tour London, 1999, Top 8 Pro Tour Chicago 2003, Top 8 Pro Tour Venice 2003, Top 8 Pro Tour Magic 2015. Member of Magic: the Gathering Pro Tour Hall of Fame class of 2013. 25 Grand Prix Top 8’s with 7 wins. Huey has already won Grand Prix Cleveland and Kyoto in 2017. Your Go-To Card in Magic: Puzzle Quest for this Planeswalker: Unlicensed Disintegration, Devils Playground, Lashweed Lurker, Olivia Mobilized by War, Inner Struggle, Lightning Axe, Volcanic Rambler, Scourge Wolf, Devour in Flames, and Spark of Creativity. Huey enjoys playing with Chandra because red has so many efficient damage spells. Combining theses with her second ability (Scorching Strike) makes it very easy to control the board. Olivia, Mobilized by War and Devil’s Playround are great cards on their own and combine to become ever more powerful! Each of the 1/1 Devil tokens gets Olivia’s bonus, leading to some big life swings.